Here is the second part of our Cairo travel vlog trilogy. Ed and I booked a Coptic and Islamic Cairo Tour for our second day in Cairo. We were planning to have a do-it-yourself trip, but since we've been hearing lots of negative news lately, we searched for a well-recommended tour online. Emo Tours is one of the trusted travel agencies we stumbled upon. We booked our first and second day tours with them, and they served as our security blanket while we orient ourselves with the city. Although we realized that Cairo is pretty safe and we can actually do the tours on our own, it is great to have a sightseeing guide who can share useful and interesting information about the city. Watch the first part of Cairo Travel Vlog series here: The Pyramids! Finally! We have an Egyptian artwork on a papyrus for one of our blog readers/Instagram friends! Head over to my IG Highlights to see what it looks like. 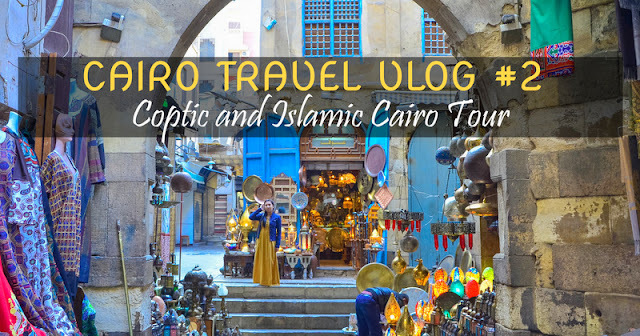 To join the giveaway, all you have to do is to leave a comment in this blog post or in the first Cairo Travel Vlog. This giveaway is open to UAE residents only as we want to hand over the prize personally. Yasss! Let's meet! :) Winner will be randomly picked on Dec 22, 2017 at 11 PM.